A couple of days ago, I highlighted a worst of the worst NOAA climate monitoring station in Arizona with the help of a scientist from the University of Washington. 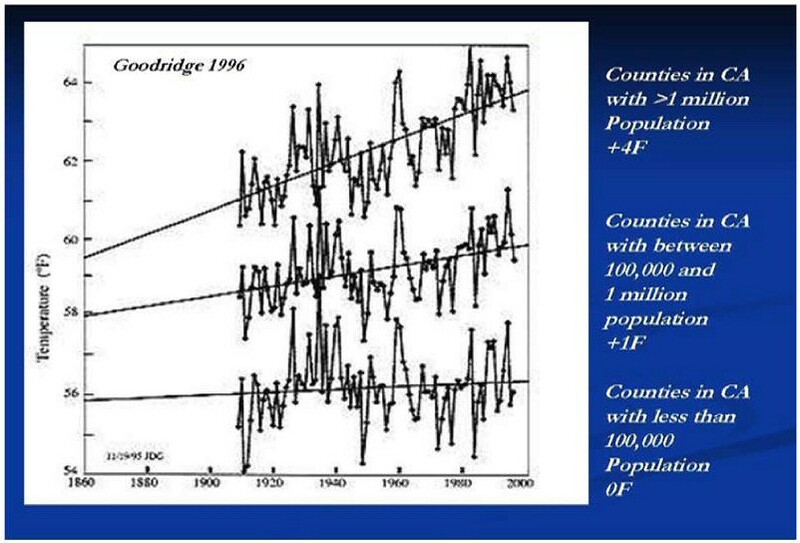 My friend Jim Goodridge, former California State Climatologist continues to be busy in his retirement, and sends this along today. He’s been tracking a group of weather stations in California, and has been doing so for over 20 years. In fact, it was Jim who first introduced me to that light bulb moment where I realized that global warming wasn’t really all it was cracked up to be when he made this short publication in the Bulletin of the American Meteorological Society in 1996. I guess you could say it was the graph that launched a thousand blog posts, because as we all know, CO2 can’t heat differently based on county population.